Introducing the world's first 5W VHF marine transreceiver that floats! 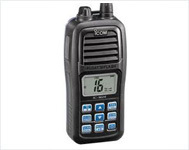 If you drop the IC-M34 into water, the radio comes up to the surface so that you can easily retrieve it from the water. As the radio has a rugged submersible body, it will keep on working even after it has been submerged. 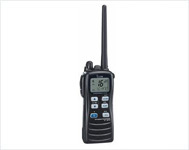 Reliable marine communications that won't let you down in or out of your boat! 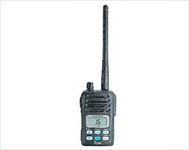 The radio with More Power (6W), More waterproof (IPX8) and More form factor (easy to hold and operate). 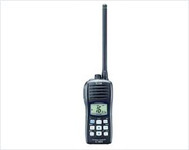 Compact Body, Great "Form Factor"
ICOM IC-M24 is Flot & Flash Radio. The IC-M24 has a flashing light feature that activates when the radio hits water, even if the power is off! If you drop this floating radio overboard, it's easier to find than ever, day or night. The M24 is powered by Icom's most "eco-friendly" marine battery yet.